Our Route begins at the bus stop in Kolejowa street, near the intersection with Słoneczna street. 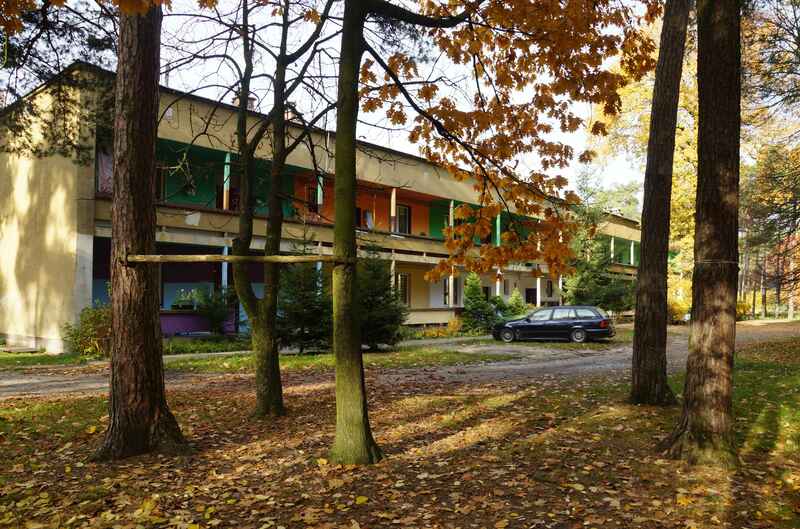 We take Słoneczna street to reach the first buildings of the residential estate of the former Lignoza plant. ● Pustków Plant Gate Buildings (Lignoza S.A. in Katowice) – currently: Lerg S.A.
On foot – total walking time: 54 min. By bike – total riding time: 16 min. The work on the housing estate for the employees of the future plant (still under construction) began on 3rd February 1938. Situated about 1 km away from the plant, in a woodland area, the estate made use of barren sandy soil overgrown with pines. Such a location was influenced by both practical and economic considerations. The buildings were located to the south of the main road, which closed the area from the north and offered the fastest access to the plant. The plans provided for about 70 residential buildings of various types and 7 public utility buildings. The asymmetric layout of the housing estate resulted from the shape of the plot. The character of the development was also influenced by the anti-aircraft defence considerations: the air-defence trenches surrounded the estate. The centre was to be occupied by public utility buildings, such as a school and a casino (not built), as well as the blocks of flats for bachelors (only one was built), garages and a boiler house. The design envisaged a sports stadium, which was built only after World War II, but not where it had been planned. The buildings were constructed along the street, at whose end a fire station was placed (completed during the war). Locating residential development in the centre, around a pre-defined public zone (intended mainly for recreational purposes) was an interesting solution, which made it possible to obtain the effect of togetherness, whereas – simultaneously – particular neighbourhoods were separated from one another, and thus more cosy. The specificity of such a layout may be felt even today. When visiting Pustków, it is worth taking a look at the surface of Kolejowa street. A long extant section of the road built in 1938 (near the housing estate) is paved with granite blocks, which form fan-like patterns. The state of preservation of the road surface proves the quality and rationality of the construction solutions of the olden days. Another section of the road, actually going back to the times of the Central Industrial Region, may be seen in the most elegant part of the whole estate, at 17 Pustków-Osiedle street. Both roads are still in use today. 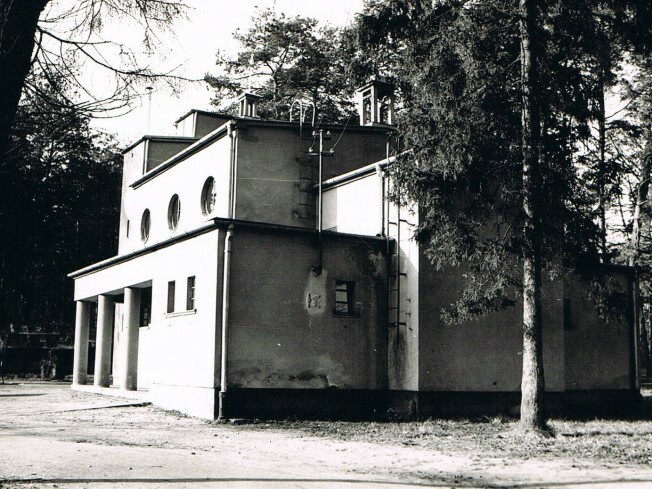 The estate was given not only transport infrastructure, but also a telephone exchange, a sewage system, as well as the connections to the gas supply and the power grid. Strangely, for several decades, some of the internal roads between the buildings had no names. Compared to other similar developments within the CIR project, this housing estate had elegant houses built for office workers, engineers and directors. 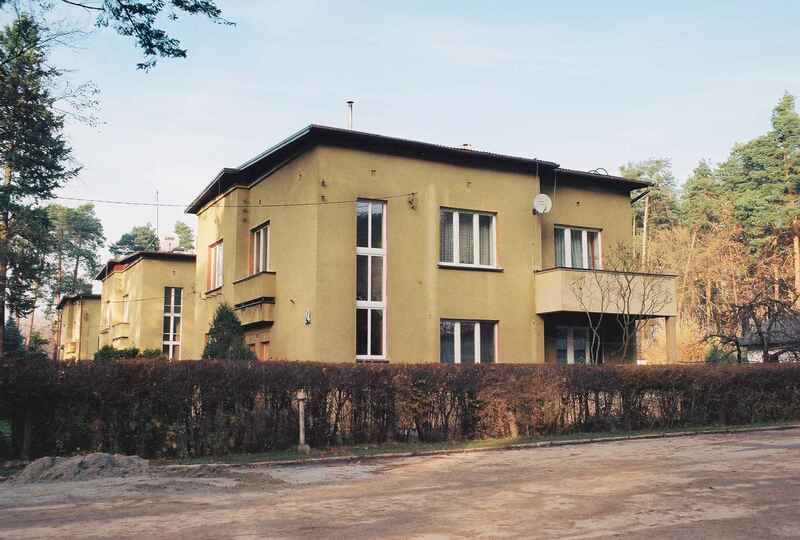 The first site on the Route is the director’s villa (today: 11 Pustków-Osiedle street). Currently, it is privately-owned. 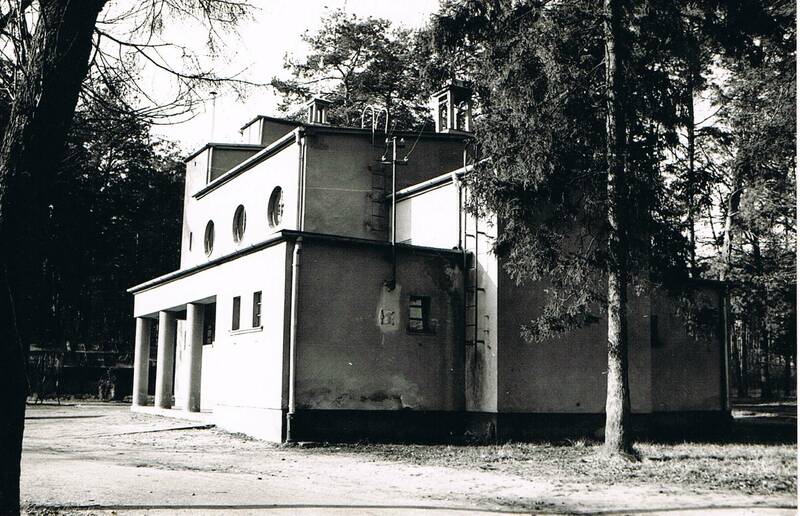 During World War II, it served as the quarters for the Nazi German commanders of the military training ground. One of the visitors was Heinrich Himmler, Commander of the Waffen-SS, Gestapo and Police, who arrived in Pustków to inspect the Estonian Legion of the Waffen-SS, and the missile testing range in Blizne. The design of the villa was similar to that of the other buildings of this type in the CIR towns. The main entrance led to the hall. Next to it was a stairwell. The ground floor comprised a kitchen with a pantry and a servant room, a dining room, a study and a living room with a door leading onto the terrace and on, to the garden. Upstairs, there were a day and a night sections, with two bedrooms and a bathroom connected to a dressing room. The usable area of the house was 180 m2. The basement included a central heating boiler room. An innovative solution applied in the villa was a special decorative ceiling lighting system, mounted in the study, the living room and the dining room, which was a distinctive feature of the interior, compared to other houses of the type. Now, we will see the layout of the housing estate for engineers (today: 12, 13, 14, 15, 16 and 17 Pustków-Osiedle street). The engineers’ section was located in the western part of the estate. 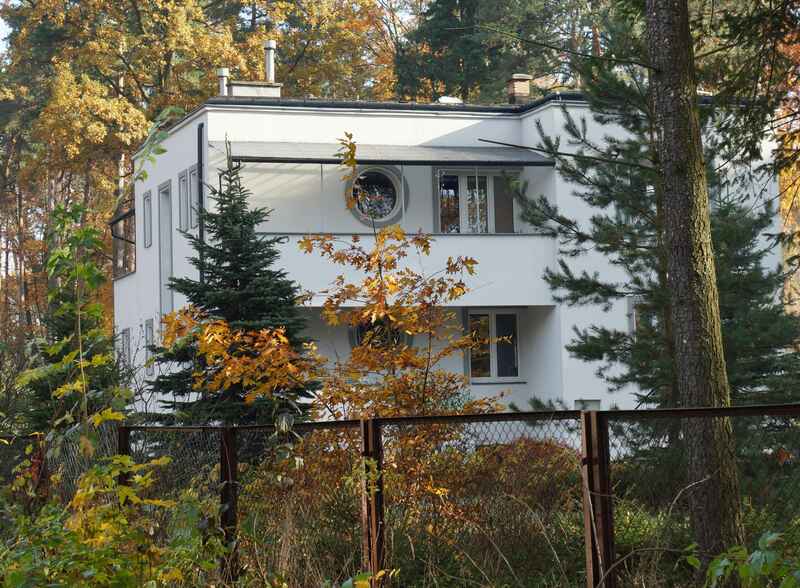 Before World War II, six villas had been built for engineers, based on the designs slightly different from that of the director’s villa. Their usable area amounted to about 150m2. The comfortable, capacious rooms were arranged similarly as in the plant director’s residence. The only difference was the utility doors added to the kitchen and the servant room. At the construction stage, attention had been paid to how the houses were arranged along the street, to ensure appropriate exposure of the daytime rooms to daylight. 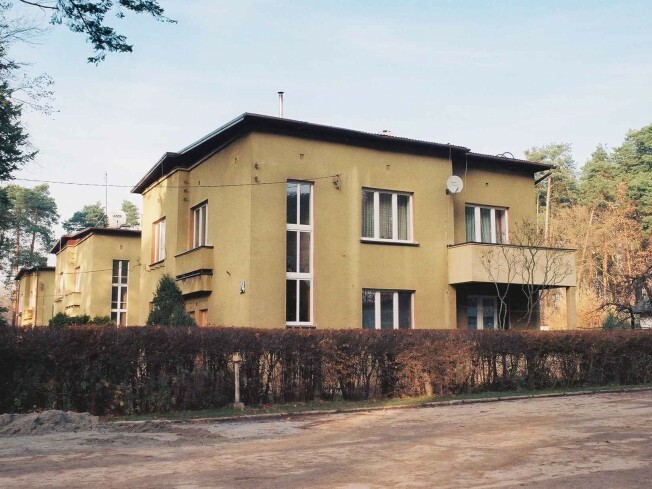 After a tour of the engineer housing estate, we move on to appreciate the layout of the office worker estate (today: 19–24 Pustków-Osiedle street). 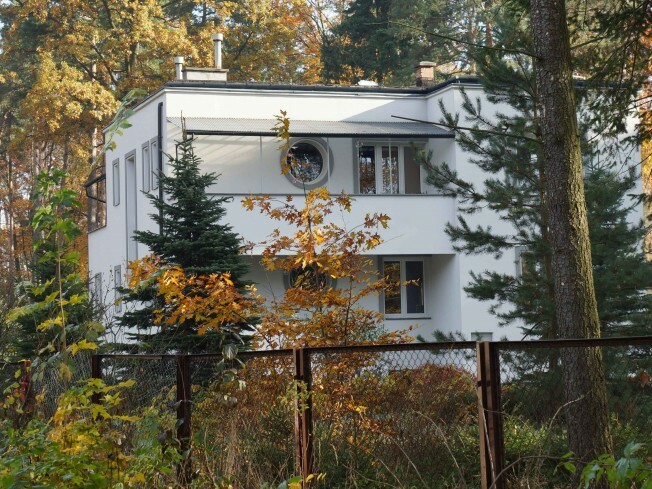 Until the outbreak of World War II, seven villas for office workers had been completed, which – including six engineer villas – accounted for only one third of the original plan. Twenty eight development plots had been prepared, each intended for two houses. Each of the houses – designed for two families – contained two identical flats: one on the ground floor and one upstairs. Independent entrances were located in the central part of the buildings: one of them led directly to the ground-floor flat, the other gave access to a small stairwell leading upstairs. A small, centrally located hall offered access to a bedroom, a bathroom with a toilet, a kitchen with a pantry and the adjacent servant room – all situated on one side. The opposite section comprised a dining room and a study, arranged enfilade. The usable area of the flat was about 100 m2. The architecture of those villas exemplifies the mature, well thought out Modernist construction style of the late 1930s. Their right proportions, as well as numerous solutions – both functional and visually attractive – applied to the terraces, balconies and the façade arcades, make these buildings a valuable item on the map of the development projects implemented at the Central Industrial Region time. We leave the office worker estate and walk in the direction of the extant Modernist chapel (at the parish of St. Stanislaus the Bishop) designed by Leon Dietz d’Arma. Currently used as a cemetery chapel by the congregation, it is hardly open to tourists. This chapel is the only surviving building of the type dating from the time of the Central Industrial Region development. Now, the Route gives us an opportunity to see the urban layout exemplified by a housing estate for foremen. It is different from the other urban layouts found in Pustków. 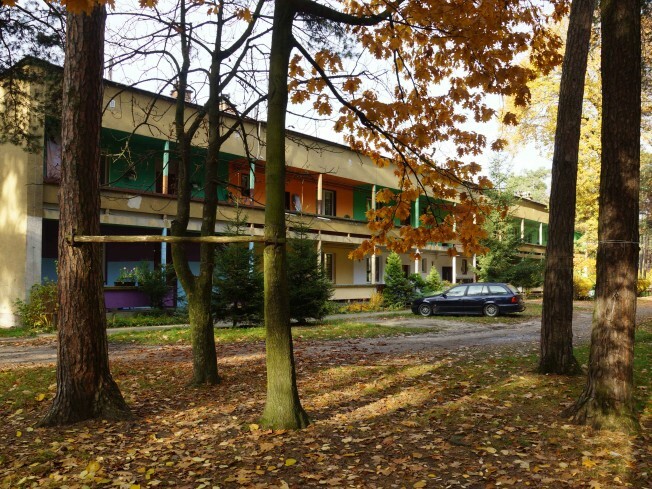 The houses for foremen (today: 28 and 28 Pustków-Osiedle street) resemble the present-day blocks of flats. Each family was allowed a usable area of 65m2. Four flats were situated on two floors, accessed from the centrally located stairwell. The house intended for bachelors was additionally equipped with servant rooms, as well as the loggias on the garden façade. The compact appearance of the foremen’s buildings was similar as in the CIR developments in other towns. The last – optional – site on the Route is the gate building complex of the Pustków plant – currently, the gate of the Lerg S.A. company (at 59d Pustków-Osiedle street). The plant is not open to tourists, but we can see two buildings at the gate, which go back to the CIR period. Characteristic here is the semi-circular yard in front of the entrance. The buildings around the gate were office buildings, but they included separate porter’s lodges: one for ordinary and one for office workers. The construction of the plant began in 1937, in the Pustków-Las locality. The military management of the Lignoza company in Katowice decided – in agreement with the local military authorities – to launch the production of formalin, necessary for producing plastics. Also, the plant was to manufacture incendiary materials and explosives. Out of the 600 hectares held by the company, the plant premises were to occupy an area of 163 hectares. The location of the plant in a forest, among tall trees, was dictated by the military production requirements in terms of security. Due to the specific production, which required adequate air circulation ensured by an appropriate location of the buildings, they were arranged along an orthogonal road network. The plant included the departments of pyrotechnics, nitro-compounds and incendiary munitions, as well as a general, mechanical and plastic departments. The railway tracks on the premises had three branches, each with a separate siding. The construction of the plant required observing the security and military secrecy standards. Any documents issued were recorded in the registers, and the designs used during the construction were numbered. When no longer needed, they were immediately burnt in the presence of a formally appointed board. The entrance complex, which is the last item on our Route, consisted of two identical buildings. One was intended for the technical and administrative staff. Its ground floor was adapted for a porter’s lodge and a guardroom, a register room, the accounting and administration department rooms, and a reception room (with a waiting room). Upstairs were the director’s office, the plant technical office, a conference room, the expedition department and administrative rooms. The attic was not used. The basement contained the archive and the plant security rooms. The other building contained a separate porter’s lodge for manual workers, with a cloakroom, bathrooms and toilets. There were also a medical room and a vast multi-purpose hall. Upstairs, the same layout was applied, which was dictated by the large number of the plant workers. The buildings were placed at right angles to the main road. Their architecture was determined by the subdivision of the whole contour into three differentiated shapes. The aesthetic ideas applied here included the single vertical window in the administrative section, rounded front corners of the shorter side of the building, and the symmetric subdivision of the elevation by means of windows. In the office worker entrance building, a very tall narrow window was added, which let more daylight into the corridor. The quality of the finish was varied too: in the office worker building better quality materials were used. The stairs were of granite (adorned with the plant logo), with well-profiled curved banisters. Ceramic floor tiles formed colourful motifs. In other plant buildings, no decorative elements were introduced – their looks were simple, neat and functional. In 2009, Lerg S.A. became the new name of the plant. Having visited the entrance buildings, we return to Kolejowa street and head for the nearest bus stop.